I would like to share a testimony about my 13 year old son Jonathan who was developmentally disabled, and was killed in 2007 by a direct care worker. Jonathan had a special love for Jesus from the time he was just a toddler. He would ask to watch the Jesus Film over and over, which is taken word for word from the gospel of Luke, and is not an animated film. So many times when we would ask him, “Jonathan, where’s Jesus?” he would smile and point up to Heaven, and then to his heart. We did not teach Jonathan to do this, and we knew that even though Jonathan couldn’t talk, or do very many things, that his relationship with the Lord was real, a gift from the Lord. Whenever we would ask Jonathan if he loved Jesus, his eyes would light up, and he would nod his head with an emphatic yes. His love for Jesus was evident throughout his entire life, and he always had an unconditional love for all people. He would often hug people, not noticing their size, color, age, or socio-economic background. Many times the people would look like they had not received a hug from anyone in a long time. We soon came to realize that this was the ministry that the Lord had given Jonathan. 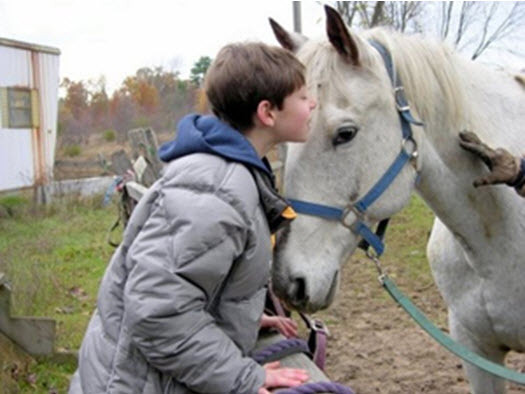 Jonathan also had a passion for horses ever since he was a toddler, that he never outgrew, and he loved to ride horses or to be with them every chance he could. In 2004, my then 11 year old son Jonathan was abused and neglected at a private residential school for children with autism in Dutchess County, New York. After we removed Jonathan from the school, we contacted several State agencies to investigate the abuses of our son, which included withholding his meals for behavioral management for over a 5 week period of time, causing him to become emaciated, secluding him in his room for extensive periods of time, causing him to miss 8 full days of school over a two week period, and illegally restraining him repeatedly, causing him to sustain massive bruising over his entire body, which went unreported by the school for investigation, as required by law. The school had no consent from us, as Jonathan’s parents, or any Human Rights Committee to do any of these things. After the investigations were complete, and hundreds of pages of documentation had been compiled, we were denied access to all of the records regarding our son, even under FOIL. We knew that our son had been abused, but without the records, we knew that it was going to be almost impossible to prove the cruel and inhumane treatment of our son at that school. The records had been “sealed” by the State, as had been done for decades, and the State had “unfounded” the abuse of our son. The records were never turned over to the police, and therefore no one at the school was held accountable for their actions by law. We were devastated. How could the State possibly be able to keep the records of our own son, who is disabled and nonverbal, from us? We wrote countless letters to officials, but most of them were never even responded to. I began crying out to the Lord, and my prayer at that time became constant, “Lord, this is so unjust. You have to do something. Please overturn the State of New York.” This remained my prayer for years. In 2006, just about a year before Jonathan was killed, I had a dream. In the dream I was sitting at a large, heavy-looking wooden table, flipping through a large book of laws. Each law was written on a separate page of parchment paper, and I was flipping through one page at a time, front to back. When I got to the very last page, I saw that it said “Jonathan’s Law” across the top, written in a fancy script. There was writing underneath the “Jonathan’s Law”, and at the bottom of the page were two spaces that said “Signed” and “Dated”, which were both blank. When I woke up, I said to my husband Mike, “The Lord gave me a dream.” I just knew the dream was from the Lord. I told him the dream, and then I said “But I don’t know when this ‘Jonathan’s Law’ will happen, because the spaces marked ‘signed’ and ‘dated’ were both blank.” Later that day, I was thinking about the dream and praying, and I asked the Lord “When?” Immediately, the year 2007 popped clearly into my mind. I told Mike that I believed the Lord had told me that “Jonathan’s Law” would happen in 2007, and the current year was 2006. Since my husband and I have absolutely no legislative background, a couple of months later we began to ask several people “What do you have to do to get a law passed?” We were told by someone to go to a legislator in Albany to ask them to sponsor a bill for us, which they would help us to get passed into law. After meeting with Assemblyman Harvey Weisenberg, who also has a severely developmentally disabled son, and his staff to tell them our story, he agreed to sponsor a bill for us. I got so excited I said “How long do you think this will all take?” I’ll never forget his response. He held up his hands as if to say “Slow down”, and stated that most of them take about 5-10 years, if they could get them passed. My heart sank, and I said to Mike, “I must have heard the Lord wrong, but let’s just go ahead and get the process started anyway.” After meeting with the Assemblyman and his staff about three or four more times over the next few months, the information about the proposed bill was finally sent to bill drafting for several months, and we did our best not to think about it. After Jonathan was killed on February 15, 2007, and “Jonathan’s Law” was launched into the media by the Assembly, we were told by many people that we would never get Jonathan’s Law passed. The opposition from most State agencies for the disabled was fierce. They did not want families of the disabled to be able to have access to records of incidents or allegations of abuse. The reason is very obvious–liability. Whenever people would tell us that we would never be able to overturn the State of New York, I would think to myself “I know we’re not.” But I would remember the dream God gave me. Three months after Jonathan was killed, on May 5, 2007, then Governor Spitzer signed Jonathan’s Law, officially overturning the State’s legal right to withhold the records of incidents and allegations of abuse of the disabled from their families. To me it was an awesome victory for true justice, and an answer to years of prayer. Through my precious son Jonathan, God had done what many believed could never be done. Jonathan’s Law not only opens up the records of the disabled under OMRDD (The Office of Mental Retardation and Developmental Disabilities), but also the records of people within OMH (The Office of Mental Health) and OASAS (The Office of Alcohol and Substance Abuse). About a month after Jonathan was killed, God gave both Mike and me, separate dreams on the same night, of Jonathan on a white horse in Heaven. Mike saw Jonathan sitting on a beautiful white horse, holding a sword. He said that Jonathan was wearing a very ornate breastplate, and looked very handsome and mature. I saw Jonathan riding full speed on a white horse. His hair was moving up and down to the pounding of the horse’s hooves. He was holding the reins in one hand, and in the other he was holding a sword drawn high above his head, as if riding into battle. He was wearing a shiny breastplate, and his clothing was completely and off-white color. He was not smiling, but his expression was very focused, and was one that I would describe as “Purpose”. He looked very mature. When Mike and I compared our dreams, we were amazed at the similarities. I then understood why the Lord had given Jonathan such a passion for horses ever since he was a toddler. The Lord was preparing Jonathan for the horse he would have in Heaven. About a week later, Mike and I attended a memorial service for Jonathan at OD Heck, which was to help the other children there with closure. At that memorial service we were given a gift of a picture of Jonathan with a white horse which we had never seen. In the picture, Jonathan is standing on something, leaning over a fence to kiss a white horse. Jonathan’s teacher had taken the picture on a digital camera a couple of months before he was killed, and had forgotten all about it. She had it printed out as a gift for us, but she could not imagine the significance of that picture to us. The picture was a confirmation of what the Lord had shown us in the dreams. A couple of days later, I went to my concordance to look up any scriptures about white horses in the Bible. In Revelation 19:14 it says, “And the armies in Heaven, clothed in fine linen, white and clean, followed Him on white horses.” I was amazed that this was exactly what the Lord had shown me in the dream, right down to the linen clothing. We know that Jonathan has been given a white horse in Heaven, and that he now rides with the armies of God, and he continues to fight injustice with us, now from Heaven. In Psalm 139, it says that the Lord has every one of our days written in His book while we are still in our mother’s womb. He does not promise us tomorrow, but He does promise us eternity with Him in Heaven. Heaven is our destiny as believers in the Lord Jesus Christ, who have received Him as our Lord and Savior. In Revelation 21:5, it says, “And He who sat upon the throne said, Behold, I make all things new.” My son Jonathan is already there, and all things have been made new for him. What an inspirational, beautiful story! I got chills all over, the more I read about Jonathan on that majestic white horse, in Heaven. My chills were actually for two reasons. The first, of course, was reading of your miraculous, very similar account(s) of seeing Jonathan on that horse – with a mature, determined look on his face. Then, when that photo of him kissing the white horse was presented to you, I (or any reader) then knew for sure – like the two of you did. God let you see why He needed Jonathan back so soon – He had a VERY important job for him, that obviously only Jonathan could do – He knew over 13 years earlier, that Jonathan was His chosen one for that job. 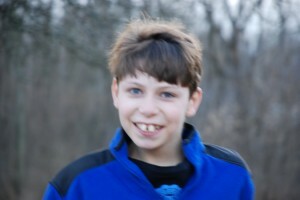 Now an angel, Jonathan would fight for those whom God had made special – like He had made Jonathan. I think God was also showing the two of you that you both will be most happily reunited with Jonathan one day. I know that he’s very happy. I want to tell you the other reason that I got chillbumps reading about your son. Earlier, I was on a webpage with many links. One of them, though, caught my eye, and as I scanned the page, my eyes kept going back to that ONE link – “Jonathan’s Law.” So I clicked on it, to see what it was. When I got through reading the story, I couldn’t believe it. First, I was amazed and moved by the part that I wrote about, above – when you wrote about Jonathan and the horse. But also, I understood why it was, that God wanted me to click on your link. Right now, Jonathan is (hopefully – I said a prayer), fighting for ME right now. Like Jonathan, I have some ‘special mental areas’, also, and I have recently gone through a series of injustices that you would not believe. As much trouble as the two of you had getting that bill passed (congratulations, by the way – what a great, worthy achievement, because of your tireless work) – but again, because of my mental health, I have been put in a position that I don’t know if I’ll be able to even survive. And like Jonathan, I had done nothing wrong, either. When I pray from now on, I’m going to ask the Lord to remind Jonathan that I REALLY need him to fight hard for me right now, because I can’t – and nobody – anywhere – will help me. I HAD felt so alone until I read about your little angel in Heaven, fighting atop his big, beautiful white horse – for people back here on Earth – like him and me. Web Site Optimization by Darcy Knapp Consulting, Inc.